You thought you were buying your dream home, but now you realize that you'll struggle to afford the monthly mortgage payments. Or maybe you thought that new car would look great in your driveway, only to realize after you signed the sales contract that it barely gets 15 miles to the gallon. We all make bad decisions. 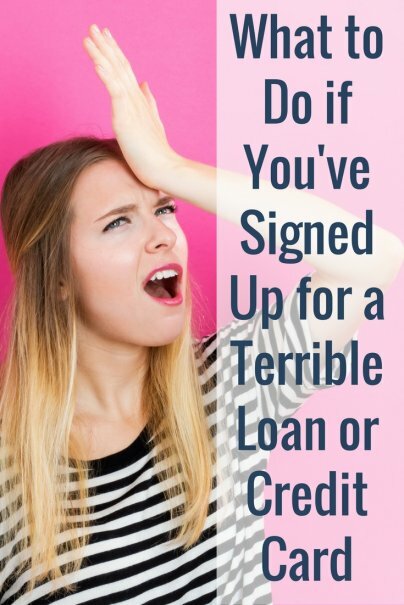 But when you sign up for a bad loan or credit card, those bad decisions can come with serious financial repercussions. Fortunately, a bad loan or credit decision doesn't have to be permanent. Here are some financial contracts you might regret signing, and the steps you can take to get out of them. Maybe you thought refinancing your 30-year, fixed-rate mortgage loan to a 15-year version was a smart financial move. A 15-year loan, after all, would give you a lower interest rate and save you thousands on interest payments. Unfortunately, you overestimated your ability to make the higher monthly payments that come with a shorter-term mortgage. You can get out of a refinance agreement easily if you act quickly. The "right of rescission" gives borrowers the right to cancel their refinance agreement if they do it within three days of either closing on their loan, or receiving their loan disclosure documents, whichever comes first. You don't have to provide a reason for backing out of your refinance agreement. These three days are business days, but they do include Saturday. If you want to cancel that refinance, act quickly. The three-day right of rescission applies to home equity loans, too. The rules are the same for refinancing: If you want to back out of your new home equity loan, you have to do so within three business days. There is a reason for the right of rescission: The government wants to offer consumers a final way to protect their homes before they take on new loans. Homes are used as collateral in refinances and home equity loans, meaning that lenders can take these assets if their owners stop making payments. The right of rescission gives consumers one last chance to avoid signing up for a new loan that they might not be able to afford. Consumers often mistakenly believe that the right of rescission applies to buying a single-family home, as well. Unfortunately, it doesn't. Unless buyers include a set cooling-off period in their sales contracts — specifying a certain number of days in which they can change their mind about buying the home — walking away from an agreement to buy a single-family home can cause them plenty of financial pain. After buyers sign a contract to buy a home, they write out an earnest money check. This check, which is supposed to show sellers that the buyers are serious about purchasing their home, is deposited into an escrow fund until the home sale actually closes. The amount of earnest money buyers deposit varies, but it is usually 1 percent to 2 percent of a home's sale price. For a $200,000 home, buyers can provide $2,000 to $4,000. If buyers change their mind and walk away from a home purchase, they will usually lose that earnest money, breaking a sales contract could cost them thousands of dollars. But there are exceptions, known in the real estate business as contingencies. If the home inspection turns up serious problems, buyers can usually break the contract and keep their earnest money. If buyers can't qualify for a mortgage loan to finance the purchase of the home, they can again usually break the contract and keep that earnest money. Things are different when you sign a contract to purchase a condominium or co-op. You'll still have to provide earnest money. But you also have a window of time — which varies according to the state in which you are buying — to break your contract without losing that money. Condo and co-op purchase agreements come with a review period. During this period, you can opt out of the purchase agreement you signed and receive your earnest money back, no questions asked. Just make sure you act within the review period. This review period can vary significantly. In North Carolina, buyers have seven days to back out of a purchase agreement without suffering a financial hit. In Florida, the review period lasts 15 days. Make sure to check what the review period is in your particular state. If you buy a car and finance it through a traditional auto loan, you're pretty much stuck, even if you don't like the car. If your car has continual mechanical problems, and is always in the shop, you might be able to turn to your state's lemon law to cancel your purchase contract. But that is a long shot. If you are leasing a car, you have more options. You can transfer your auto lease — and get rid of that car you don't like — by using a third-party service such as Lease Trader or Swapalease.com to pass your lease onto another consumer seeking to lease a vehicle. Before you do this, make sure that your leasing company allows such transfers. And be sure to read the fine print in your lease. Some leasing companies will list you as guarantor on your lease even after you transfer it. If the person who takes over your lease stops making payments, your leasing company will seek to collect those payments from you. Is there a credit card in your wallet that comes with sky-high interest rates? Or maybe it's just a basic card that doesn't offer any rewards. You might decide to cancel that card. But you should think twice. Canceling a credit card can hurt your credit score, even if you never plan to use that card again. The amount of available credit you have is a determining factor in calculating your credit score. Canceling a card will remove some of your unused, available credit — and, if you carry a balance on your other cards, automatically increase the amount of available credit that you are using. As a result, your credit score will take a hit. It's often smarter to simply not use that card than to cancel it.